This is also the first forum I've actually signed up for and stuck with it. Already made some questionable friends lol. My name is Rayne coming from nowhere Fort Wayne Indiana. Ive been around guns since i was real young. Got my first saiga 12 about six months ago building it up to this day. After I get my parts back from pauly and get it duracoated, I'll finally post some pictures. Really into cars and motorcycles. Thats about it. Glad I joined and look forward to talking with guys. NEWBIE ALERT! I have been doing a lot of reading here and there. finally purchased a S12. cant wait to start playing. I'm new here! Love it, searched a lot before I registered, still searched a lot more since registered. My big post I typed isn't where I posted it? Gone? Lost to the round file of the Internet? Oh yeah and I'm on an iPhone, is there a new post and new replies to your posts option on this forum? As far as the retaining plate goes, I would recommend that you see if Greg at CSS would be willing to send you a shepards crook spring instead. They work great, are easier to install in my opinion, and will definitely stay put. CSS has a great tutorial video on youtube that shows you how to install it. Just search for "carolina shooters supply shepards crook"
I'm a noob here, too, but not a noob to gun forums. I've frequented a half a dozen of them for over 15 years. I recently acquired a Saiga-12 so I added this one. Great place to join up with you guys. Thanks for the wealth of information I've already gleaned! Hey guys new here, been reading up on all the info. Getting ready to buy my first S12. Just curious what's the going rate these days for a new unmodified S12? I'm new as well. Bought my s12 off a guy in town I know. I paid 900.00. 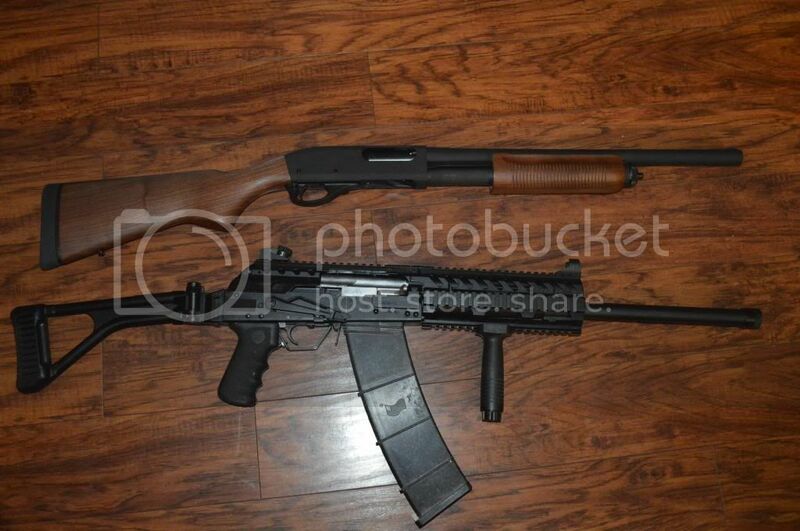 It did come with 20 Rd drum and a 5&10 Rd mag. Dunno. Think I got a fair deal seeing as how I couldn't find one at my lgs or any gunshow I've been to in the past 6 months. Just a newbie with a comment thanking the forum for this great and informative resource! I've already saved money with the CSS discount code, and stopped myself from destroying my Saiga by pounding on the rear dovetail sight that just would not drift out! By searching for other members previous questions, I found the best way to remove a tight sight was to saw it in half until it popped out. Did that, and got my CSS short rail replacement installed without any problems. Hope to share in the picture thread once I get a few photos taken! New here, but have owned my saiga for a bit over two years. it is already heavily modified. I joined here to gather information on converting it to an SBS. As you guys can see it has a ChaosUSA quad with hindged top cover that is attached to the dust cover as well as their hk style sights. It has a coversion kit from CSS and a crappy tapco stock as well as some polishing and reliability parts. Newb here. I've been building AR's for a few years and wanted something different. I picked up a MAK90 Sporter AK and got the AK bug. I just picked up a used Saiga 12 froma local shop yesterday. It has some things done to it already, but I'm already making plan for it. Great site with lots of info! I'm sure I'll have some questions along the way! What's a used s12 bring? Just curious. Used Saiga's are going for $2.95 to $3.50. I am buying them for $5.00 just because I am cool like that!